Are you looking for a place to stay in Roumanie? Choose your accommodation in Bucarest apartments which have facilities to suit everyone requirements and are ranging from small studios to 3 and 4 room apartments. A real alternative to hotels, located in Unirii Square, it is the only flat situated at the last level, above Horoscop Hotel. It comprises large rooms, entirely air-conditioned. 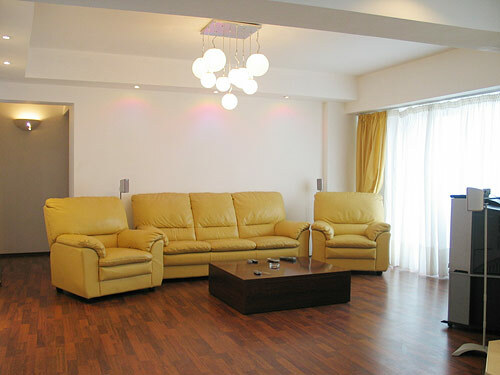 The open living room is a light area simply furnished with leather sofa and armchairs, high-tech endowed. The sobre line of furniture is continued in the bedroom (a dark wood master bed, night stands and full sized wardrobe). The open kitchen is fitted for self-caterings (devices, ustensils, china, dine-in nook and furniture made to measure). 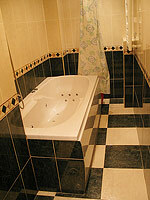 The bathroom is a special place for its appliances: jacuzzi bath tub, power shower, basin, lavatory. Besides the two usual balconies, the residence's style is enhanced by its terrace, the roof beeing entirely ceramic covered and furnished with deck chairs. The banks, the big department stores, the cultural institutions, the Palace of Parliament, Commerce and Industry Chamber and most of the state's institutions are grouped here. This area has a strong commercial character but not only.